If you need them straight please contact us if stock is available. Once our order placed into production, there will be no refund. So if any change to your order please let us know ASAP. 50% deposit is required to confirm orders, balance paid before shipment. We accept: Paypal, Bank deposit. Company cheque. Here is a size chart for your reference, pls measure your girl carefully to avoid disappointment. Bust/Chest – Measure over the fullest part of the chest. 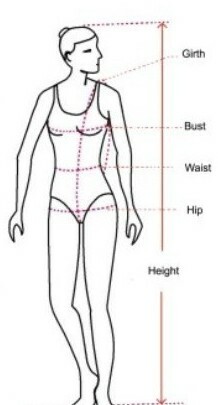 Waist – Measure around where the waist naturally indents. Hips – Measure around the fullest part of the hips. Girth – Measure from the midpoint on the shoulder towards the front, through the crotch and back around to meet the midpoint of the shoulder. Copyright © TWC Network (Sydney) Pty Ltd. All Rights Reserved.